A pleasant hike to the beautiful (and popular) Missouri Lakes in the Holy Cross wilderness, this easy 2 day backpacking trip (or single-day in-and-out hike) will whet your appetite for a longer wilderness trek with a multitude of tranquil lakes and a large dose of high altitude alpine scenery. The loop begins at the Missouri Creek Trailhead, just down the road from the Fancy Creek Trailhead. In fact, the trailheads are so close to each other, you can consider this a loop hike. The Missouri Creek Trail takes you a short 3 miles to the beautiful Missouri Lakes (there are 4 of them) which sit on a bench at the foot of twelve thousand foot rocky peaks right at treeline. Further in, the trail heads up a few short switchbacks to a splendid view of the Holy Cross area at Missouri Pass. Head further to the Fancy Creek trail intersection and complete the loop by winding past Treasure Vault Lake, over Fancy Pass back to the Fancy Creek trailhead. The Missouri Creek Trail starts off as a pleasant path through an aromatic lodgepole pine, spruce conifer forest. But it quickly takes a sharp turn to the right, heads uphill and passes the Holy Cross Wilderness sign/marker. Shortly afterwards, the trail crosses Missouri Creek on a small footbridge and follows Missouri Creek higher into the wilderness towards the not so distant Missouri Lakes. After 2.6 miles, the forest thins, and Missouri Lake No 1 will appear on the left. Lake number 4, is off trail and behind a ridge to the south. Lake no 2, the largest of the lakes is ringed with backcountry campsites. Remember to choose a legal campsite that is at least 100 ft. from the body of water. The campsites closest to the water are illegal and should not be used. Please abide by the posted signs not to denude the area of vegetation by building illegal campfires. If you wish to have a fire, bring your own fire wood as well as a stove to burn in. Do not build campfire rings here, because they are unsightly, and volunteers will work to remove them after you are gone. Lake no 3 is a few steps further along the trail at 3.2 miles. Just beyond Lake 3, a few short switchbacks take you up to the top of Missouri Pass (3.7 miles from the trailhead, 12,002 ft high). Views of the lakes below, and of the surrounding peaks in the Holy Cross wilderness open up at this point. Treasure Vault Lake beckons below you on the other side of the pass. The trail continues over the pass heading through alpine tundra and a wildflower meadow before intersecting with Fancy Creek Trail. Head uphill and to the right onto Fancy Creek Trail. The trail takes you up to the highest point on this loop: 12,400 ft. Fancy Pass. After admiring the view, descend the far side of the pass toward Fancy Lake (5.5 mi.) Beyond Fancy Lake, the trail drops steadily in elevation as it follows the general path of Fancy Creek. The trail ends at the Fancy Creek Trailhead at the 7.3 mi. mark. Recommended Camp Locations: Numerous campsites near the Missouri Lakes, or near Treasure Vault Lake. Exit at the Minturn/Redcliff exit on Interstate 70 just after the town of Vail (when heading west on I-70). Head south approximately 12.9 miles on Hwy 24 toward Minturn. After passing through the tranquil town of Minturn, and after travelling 12.9 miles from I-70, look for the Homestake Reservoir Road (Forest Service Rd #703) at a bend in the road. The road will be marked and will be on your right. Turn right onto Homestake Res. Road. The road will immediately cross over a bridge over a creek. Homestake Reservoir Road is a maintained dirt road that is drive-able by passenger vehicles. After travelling 7.8 miles, take a right onto Missouri Creek Rd (Forest Service Road #704). After 2.2 miles, Missouri Lakes Road intersects FS Road #727. The well marked Missouri Lakes trailhead parking lot will be on the left and will be visible from the road intersection. To park at the Fancy Creek Trailhead requires taking a right and travelling a few feet up Rd #727. You’ll need a trail map as a guide for this 2 day backpacking trip. 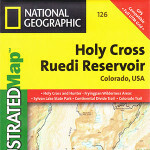 I recommend the Trails Illustrated map product by National Geographic. Clearly marked trails and land mark on a color topographic map make this high quality map a joy to own and use. Thank you for the detailed description. Do you know if the campsites need to be booked in advance? There are no designated campsites; only sites that are regularly used. This is designated wilderness in a national Forest, so you can camp anywhere. There is no system to reserve sites.